The uniform King Charles XII of Sweden, noted leader of the Caroleans, was wearing when he was killed. Caroleans (Swedish: karoliner) were soldiers of the Swedish Kings Charles XI and Charles XII. The tactics of Caroleans differed from those Western European soldiers in their greater reliance upon pikes, rapiers, bayonets, and offensive strategy, which led to victory in many battles even when greatly outnumbered. In order to compensate for its lack of manpower and resources, Sweden strove for innovative ways to make a more effective army. The Carolean army is regarded as one of the most effective military forces of their time for their achievements during the Great Northern War, as shown by their efforts in many important Swedish battles. Due to the small number of Swedish soldiers, the Carolean army was always relatively small. As a result, heavy losses were irreparable, forcing commanders to choose their battles wisely and strategize carefully to keep casualties low. Despite the Carolean army's effectiveness, its small size prevented Sweden from maintaining its hold on power, as evidenced by the decline of the Swedish Empire after its defeat in the Great Northern War. After a long march into the Russian interior — where the Carolean army was exposed to scorched earth tactics and frequent small raids — the exhausted and hungry Caroleans were decisively defeated by the Russians at the Battle of Poltava. During the war, an estimated 35,000 Swedish troops died, representing 70 percent of the entire army. 25,000 Caroleans were killed in combat, with another 10,000 dying from famine, disease, and exhaustion. Strict discipline was necessary to allow the Carolean army to use highly offensive tactics which, among other dangers, exposed soldiers to medium-distance enemy fire before being allowed to respond. This tactic was intended to place the soldiers close enough to the enemy so it was almost impossible for them to miss a shot. The steadfast courage shown by the Caroleans affected enemy morale and, on several occasions, frightened Swedish enemies into retreating. In the Swedish army, troops were obligated to attack or fight where they stood. The army had stringent rules to attain this discipline, many of which constrained a soldier's private life. For example, members of the Carolean army received constant supervision at their barracks as well as in the field. "Karl XI, 1655-1697, king of Sweden" by David Klöcker Ehrenstrahl. In 1680, King Charles XI implemented many political and military reforms in parliament, making him an autocrat. His most significant reform was the establishment of the allotment system. Under this new system, all Swedish farmers were to provide the crown with a full regiment of 1,000 men, complete with weapons and uniforms. Farmers, either independently or as a group of five or less, would form a "Root" ('Roots' is a poor translation of the Swedish "rote;" more correctly it should be squadron or group) from their land and sign a contract with the crown that they would provide and support a soldier. These contracts stipulated that a soldier would be provided with a cottage and a garden plot. Cavalrymen were additionally provided with a horse by the Root. In exchange for these burdensome policies, Roots were granted a tax reduction by the crown. The Carolean uniform was among many variants of the Swedish Standard Uniform introduced by Charles XI. They featured blue great coats with yellow cuffs, white breeches, and yellow vests. Many regiments had variations of the uniform. For example, the dragoons of Bohuslän had green coats, and the regiment of Närke-Värmland had red cuffs. The artillery had grey coats with blue cuffs. As headgear, most Caroleans wore tricorne hats or a special cap called a Karpus. Members of the elite Trabant Garde cavalry were the only armored troops, wearing steel breastplates. Most of the infantry were equipped with modern flintlock muskets, although older versions were still in use, as well as rapiers and bags for ammunition. About one-third of each company were equipped with pikes. Twelve men of each company were grenadiers, typically the strongest and tallest men. The grenadiers were the only soldiers to have bayonets on their muskets, as regular musketeers were meant to use their rapiers for hand-to-hand combat. Grenadiers were often placed on the flanks of a unit to protect against cavalry. A bayonet-equipped musket was considered to be more practical as it gave greater reach than a sword when facing a mounted opponent and could be braced against the impact of a charge. On occasion, two-handed spiked clubs were used during sieges. Mounted troops carried broadswords and either two pistols each for the regiment of a horse or a carbine for the dragoons. The artillery had a smaller sword for close combat, called hirschfängare. Duels in the Carolean army was strictly forbidden, however, not unusual – Gustaf Cederström. The Carolean army was organized into regiments according to region, and divided into the following sections: Cavalry regiments, including the Jämtlands dragoon regiment, and the king's personal guards; the Livdrabanterna regiment; Infantry regiments, including the Värmlands and Västerbottens regiment; and Artillery regiments. The army also included a particular unit called the Livdrabanterna (Royal Life Guard Corps). This was a special unit made up of approximately 100 men. It was under the personal command of King Charles XII, for which he was named the captain. To become a private in the corps, one had to attain the rank of Captain in the regular army. The king's second in command was a Colonel with the title of Kaptenlöjtnant (Lieutenant-Captain). This corps fought to the bitter end, and some of its veterans carried Charles XII's coffin on its arrival to the capital for the burial in 1719. Rules were strict for the Carolean soldier. Stealing food from another soldier would lead to harsh punishment[clarification needed]. Looting, previously a part of the soldiers' everyday activities, was forbidden; however, it occasionally occurred if necessary. To take God's name in vain was among the worst crimes a Carolean soldier could commit, and the punishment for this was death, because it was vital to keep morale high among the troops, and the Christian religion was used as a way to do this. Interrupting a moment of prayer would also lead to the death penalty. Soldiers were told not to be afraid of battle or to be fearful on the field since if God meant for them to die, death would happen regardless of whether they dodged bullets or not. This rationale was crucial to the offensive tactics of the Carolean army, which required firm discipline to succeed. A soldier's daily ration was meant to consist of 625 grams of dry bread, 850 grams of butter or pork, 1/3 litres of peas, and 2.5 litres of beer. The butter or pork was often replaced by fish if available. Water was generally avoided since it was often contaminated. A) company wise B) battalion wise. A Carolean infantry regiment consisted of roughly 1,200 men, divided into two battalions of 600 men each. The battalion was the smallest tactical unit of the Swedish army and consisted of four companies of 150 men each. Prior to battle, the men were usually formed into four ranks (four men deep), however, a battalion could also be späckad with six ranks. About one third of the men were pikemen, equipped with 5.55 metre-long pikes and swords, these pikemen often made divisions in the middle of each battalion with musketeers to their flanks, however, if the battalion was späckad, the pikemen were placed in the third and fourth ranks. Furthermore, grenadiers were often attached to the flanks of the Musketeers — or by the far left and right of each battalion — to protect against enemy cavalry and toss grenades to break enemy formations (there was one grenadier for ten musketeers). On occasion, the grenadiers formed their own battalions such as the Life Grenadier Regiment. The width of a battalion was roughly 180 metres (or 135 metres when the battalion closed gaps). At the outbreak of the Great Northern War, every Swedish musketeer was equipped with a sword and usually a 20 mm calibre flintlock musket without a bayonet. The bayonet was first introduced to every Swedish musketeer in 1704. However, the grenadiers were equipped with grenades, swords and flintlock muskets with bayonets. The Swedish cavalry regiment consisted of roughly 1000 men, divided into four squadrons of 250 men each. The squadron was the tactical unit of the Swedish army and consisted of two companies of 125 men each. The Swedish heavy cavalryman was equipped with a rapier (almost one metre long made primary for thrusting and secondarily for slashing), a carbine, two pistols, and a cuirass. The dragoons were equipped with a rapier, musket (with bayonet), and two pistols. Certain irregular units were also used, frequently the Vlachs cavalry. However, these were not suited for combat, but only reconnaissance and to chase routed enemies. Contrary to the other regular armies in Europe, the cavalry made up half of the fighting force. 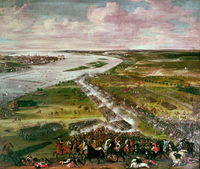 During Charles XII's invasion of Russia, the army counted 31,000 with more than half —16,800 men — as cavalry. are not to be found the wide world over except in Sweden"
Caroleans launching the Gå–På–method on Saxons in Düna, 1701. The Gå–På–method (literally "Go-On") was based on shock tactics and was the standard combat technique used in the Swedish army at the time. This very aggressive tactic often resulted in short-lived battles to counter superior numbers of enemies. According to 1694 and 1701 regulations, the infantry attack operates as follows: In four ranks with gaps, a Swedish battalion would march "smoothly and slowly" towards the enemy lines, braving enemy fire which often started at a distance of approximately 100 metres. The Swedish soldiers were told not to fire until "you could see the whites in the enemies eyes," a range of roughly 50 metres. When the marching drums stopped the two rear ranks would fill the gaps within the two foremost ranks and fire a salvo, then draw their swords. The two rear ranks would then move back to their previous position, and the two foremost ranks would close the gaps in their line, after which the battalion would resume their attack. The two foremost ranks would discharge their muskets in a final volley when they were within range to charge — a distance of roughly 20 metres. They would then draw their swords and charge the enemy, taking advantage of the demoralizing and lethal effect of their close-range volley. At this range, the powerful muskets usually felled many enemy troops, having a great physical and psychological impact on opponents. Directly after the volley, the Caroleans charged the enemy ranks with pikes, bayonets, and rapiers. Note that the pikes were used as an offensive weapon; in close combat, they had the advantage over their foes' weapons due to their long reach. Often complete ranks of enemies ran before physical contact, frightened by the long pikes and the fact that the morale of the Swedish battalion could calmly withstand their fire. This method slightly changed during the Great Northern War. The slow march was replaced with running to take fewer casualties and begin combat sooner, while optimally still frightening the enemy with the courage of a swift, unflinching advance into enemy fire. The firing distance was reduced from 50 metres to 15 – 20 metres for the first volley of the rear ranks who would no longer fall into their previous position behind the front ranks. Instead, they would follow in the gaps within. As a result, the battalion attacked in two filled ranks, which made the final charge more effective as the Carolean troops would be closely packed together, delivering a heavy impact. The battalion would also receive more support from artillery pieces, most notably in the battle of Gadebusch, where a new set of Swedish artillery inventions saw action. Close coordination between artillery and infantry where the artillery would move forward to reinforce the infantry during the attack. The cavalry was the foremost weapon of the army, with thrust rapiers they would ride knee behind the knee, which resulted in extreme clustered formations, also they attacked in the fastest possible speed. As musketeers during this period usually fired by platoon, rank, or all together, it was eventually necessary for an entire group to stop and reload. During this reload — which took 1–2 minutes to finish — an opponent could calmly march 80 metres and run 150 metres (in one minute). This meant the first side to fire made themselves a vulnerable target to the incoming enemy line. The Gå–På–method took advantage of these simple mathematics. The Caroleans would march calmly and steadily to close the gap during the enemy reload, before firing at a closer more effective range. The Swedish cavalry, just as the infantry, fought in a similarly aggressive manner (also called the "Carolingian manner"). Prior to the battle, also in contrast to the rest of Europe — which during the time would form up knee to the knee — the Swedish cavalry would form up in slight wedge formations in two or three ranks, knee behind knee to successfully achieve the most clustered cavalry formation possible to more fiercely impact the enemy. To achieve this, they had thrust rapiers which would further increase the effectiveness of the charge. The squadron would usually not use any of their pistols during the charge, only blades. In 1704 a regulation was made, disbanding the pistol completely when charging (however, on occasion, the pistols were allowed, which happened in Fraustadt, or when chasing routed enemies). In 1705, another regulation was made in which the cavalry would ride in trot during the initial phase of the attack and then full-gallop (which was the fastest possible speed) before the impact. The trot conserved the energy of the horses for the final gallop, and only galloping the horses when within charging range preserved their stamina so that they wouldn't tire as quickly during a battle. Close coordination between infantry, cavalry, and sometimes artillery was needed to break down enemy defenses successfully. Only infantry would normally risk a frontal assault on a well-prepared line, preferably with artillery assistance. Regimental cannons would keep pace with reloading infantry and protect them against enemy attacks. The Cavalry would strike the opposing cavalry or charge disorganized infantry, preferably in the vulnerable areas of the flank or rear. Cavalry was also used to cover an army in retreat or to interfere and chase remaining enemies after a successful infantry attack. If a cavalry attack were repulsed, it would fall back behind friendly infantry lines and regroup for another charge. If necessary, the infantry could fall back using alternating firing and movement. In some situations, infantry squares were used for protection against flanking cavalry attacks. This formation was effective as all sides of the square would be facing outwards, removing the risk of a vulnerable rear or flanks. In addition, the square formation presented enemy horses with a tightly packed mass of troops and a veritable hedge of sharp weapons, discouraging them from a charge. ^ Åberg, Alf; Göte Göransson (1976). Karoliner. Höganäs: Bra Böcker. pp. 26–27. ^ Konovaltjuk & Lyth, Pavel & Einar (2009). Vägen till Poltava. Slaget vid Lesnaja 1708. Svenskt Militärhistorisk Biblioteks Förlag. p 19. ^ a b Lars-Eric Höglund, Åke Sallnäs, The Great Northern War 1700–1721 Colours and Uniforms. p 22. ^ a b Konovaltjuk & Lyth, Pavel & Einar (2009). Vägen till Poltava. Slaget vid Lesnaja 1708 (in Swedish). Svenskt Militärhistorisk Biblioteks Förlag. p 19. ^ Konovaltjuk & Lyth, Pavel & Einar (2009). Vägen till Poltava. Slaget vid Lesnaja 1708 (in Swedish). Svenskt Militärhistorisk Biblioteks Förlag. p 117. ^ Charles XII and the Collapse of the Swedish Empire, 1682- 1719 - R. Nisbet Bain. p. 243. ^ a b Konovaltjuk & Lyth, Pavel & Einar (2009). Vägen till Poltava. Slaget vid Lesnaja 1708 (in Swedish). Svenskt Militärhistorisk Biblioteks Förlag. p 244.